If you read my review of THE REEF, you'll know that I lament the distinct lack of good shark movies out there. Well, you can put good viking movies up there as well, because there are basically none. Rather, us fans of Norse mayhem have had to endure such indignities as THE THIRTEENTH WARRIOR over the years, quietly waiting for a film that does vikings justice. 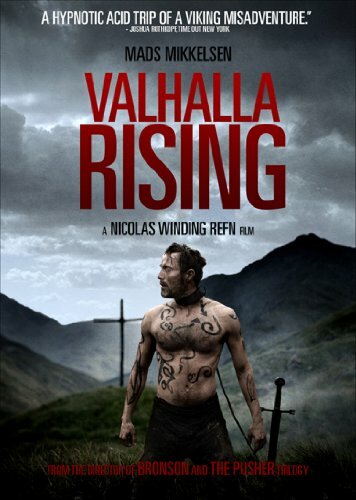 In steps Nicolas Winding Refn's VALHALLA RISING. The story follows mute killer One-Eye, who at the beginning is some sort of fighting slave. Then he escapes and kills everyone, save for a boy he talks through. They fall in with some shady crusaders headed to Jerusalem, only they get stuck in this weird mist and end up in North America (yes, I know and no, it's not well explained). And then things really go wrong. Oh, did I mention that One-Eye can see the future? Because he can. Or maybe he sees it as his past, which is his future, because vikings understood time as cyclical. Not entirely clear, and the lack of dialogue and exposition in the film leaves things like this open to interpretation. In the end, that openness is one of the main strengths of VALHALLA RISING. It's a highly atmospheric, very slow and totally surreal film, with a great score and cinematography that recollects Bergman and Fellini. It's very, very artsy. But then it's also ridiculously gory. I won't get into specifics, but if you are in any way, shape or form put off by violence in film, you should avoid this one. Violence in VALHALLA RISING is intimate, cruel and over-the-top. To be frank, I had a hard time dealing with it myself, and felt that it added little beyond shock value. There are also a few inconsistencies in the story and in character motivation that, openness to interpretation notwithstanding, are still a bit hard to get past. That said, I pretty much liked everything else about the film, and especially liked how much story Refn was able to tell with so little dialogue. Cult film coefficient: 9/10. If you can handle the violence, then this is a pretty damned good film. If you can't, though, you should avoid it like a viking invasion.